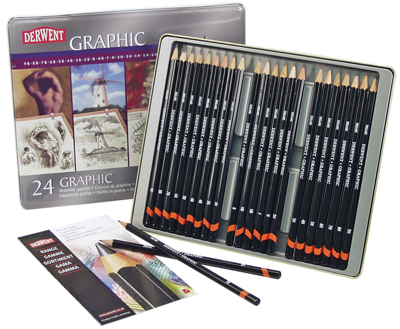 Derwent Graphic is a range of high quality graphite pencils available in 20 versatile degrees from a very soft and dark 9B to a 9H which is harder and lighter in tone. Soft pencils (9B-H) are best suited to expressive sketches and portraiture, medium pencils (6B-4H) suit design and general drawing whilst hard pencils (B-9H) are ideal for detailed illustrations. This 24 pencil set contains two each of HB, 2B, 4B and 2H and one each all grades through 9B to 9H. Packaged in a reusable tin. Derwent Artists Color Pencils 36ct.